If you are interested in reading the latest in the Rob Ford saga, this entry is not for you. I will not say much about him, but will rather explore the way I have grappled with this debacle. There has been much buzz and chatter about Ford in the last two years. That has increased exponentially in the past three weeks. He has appeared in almost every major network in North America due to his misconduct. 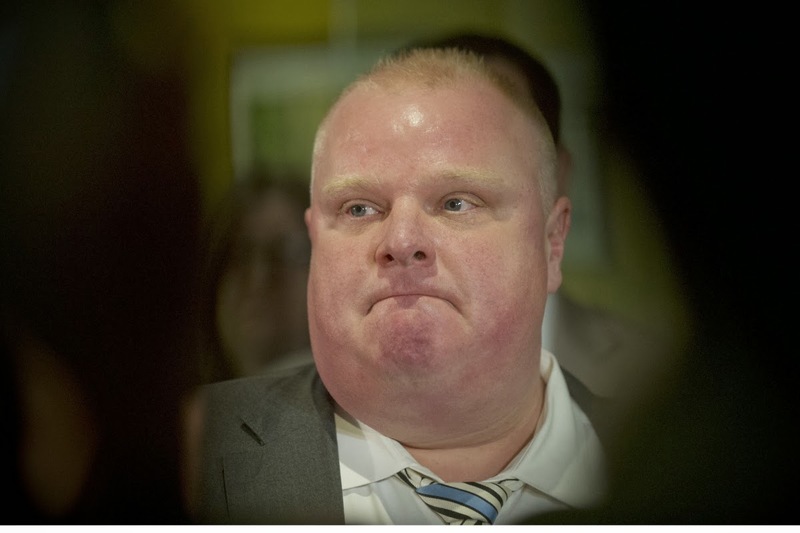 One thing is certain: Rob Ford is not perfect. He is far from it. For me, the lowest point in this fiasco is our attack on his human dignity. We have turned from mere spectators to active members in Ford’s downfall. Ford has not helped himself at all with all his shenanigans. When this mess started, we did not know how to respond to his misconduct, or as Andrew Coyne calls it, “Ford’s contempt for social norms.” Ford’s lack of constraint led to our own. One joke about his weight led to another about his drug use. We invaded his privacy, and harassed him until he felt threatened. We punched the man when he was down. Before we knew it, we started to act like bullies. Right about now, some of you might be thinking: “Wait a minute, I am no bully. The guy deserves this. Haven’t you seen the way he acts? You don’t think the guy lacks character?” Well, yes. Ford lacks character and self-control. I have paid close attention to his actions. Sometimes, I paid attention too closely. Like many others, I watched the videos and followed the buzz online. While I felt disgusted with Ford’s behaviour, I ignored my own. I turned into a bully. The saddest thing is that I constantly speak out against bullying. I talk to young people about tolerance, kindness, and forgiveness. But I forgot to walk my talk. I rationalized my actions, and forgot to love Rob Ford. Let's face it, folks: this is our Christian vocation. We are not called to like everyone, but we are called to love everyone. We are called to promote and defend the dignity of each human being. That’s what the culture of life is all about. Prayer and self-examination helps us to realize that Ford is not the only problem. We are. Ford has serious problems he has to deal with, and City Council has a duty to take him to task in order to manage the city effectively. But the biggest problem is our obsession with Ford and other misbehaving celebrities (think Paris Hilton, Lindsay Lohan, Charlie Sheen, and Miley Cyrus). Our obsession for public misbehaviour speaks of our need for a reality check. This is the point where you might feel the urge to stop reading and forget about this entry: “Who the heck do you think you are to preach to me? I don’t need a reality check.” Maybe you don’t, but many of us do. I certainly need it. As we participate in this craze, we actually encourage and validate the dysfunctional behaviour. Rob Ford needs to stop his destructive behaviour, but so do we. There is another problem with our behaviour: gossip. The way we have dealt with Ford’s actions has led us to babble about his life. In that process, we have trivialized his humanity. As Pope Francis said about gossiping: “Those who live judging their neighbour, speaking ill of their neighbour, are hypocrites, because they lack the strength and the courage to look to their own shortcomings.” We need to stop looking at the speck of sawdust in our brother's eye and pay attention to the plank in our own eyes. I am not exactly sure what is the best way to help Rob Ford. But I know we need to rethink the way we care for those we struggle to love. We need a community that keeps us accountable and helps us to love those who upset us. As we struggle to love those who are psychologically, spiritually and emotionally poor, we learn to find God, even in our own human misery. As we get in touch with that misery, we learn to transcend our tendencies to put others down. As we recognize that we are all loved and forgiven sinners, we learn to care for each other's woundedness; we discover how to heal a broken world. There is a more hopeful side to this. The debate in Toronto City Council, I watched most of it, was dignified and very thoughtful. The Fords attempted to distract from this but the councillors acted with civility and in a constructive manner. The council, in spite of its political differences, has reclaimed civility and a focus on the common good. That's what we all need to do. There are different imperatives in the personal and political worlds. In the personal world we act with compassion and forgiveness; in the political world we must act with decency and civility. Ford has blurred that line. Thank you, MJ. I agree the City Hall debate was more dignified. I am also very thankful for your explanation of the different imperatives. That distinction has informed much of what I tried to articulate. I was mostly addressing my own actions, and the actions of many who have obsessively followed this saga and in the process let the media frenzy turn us into bullies. Well said, Santi! Let's be responsible ourselves rather than prey on the irresponsibility of others. Ton approche, Santiago, est certainement valable et elle nous oblige à nous recentrer sur un aspect essentiel de l'évangile. Par ailleurs, ayant suivi la "couverture médiatique" de l'affaire Ford au Québec, je dirais qu'on a en général évité les excès d'intimidation (bullying) rencontrés dans certains médias torontois. Tout en reconnaissant avec toi que nous avons tous nos faiblesses, il reste que, pour le bien commun, les personnes engagées en politique ont le devoir de manifester et de vivre un respect pour leur concitoyens qui exclut le mensonge et le déni. De fait, trop de gens ont une image négative de la "politique" et ne s'engagent donc pas au service de leurs concitoyens parce qu'ils sont découragés par les exemples de personnes qui, dans cette sphère, ont manifesté plus d'intérêt pour le pouvoir que pour le service. Je puis porter Rob Ford dans ma prière, mais je peux en même temps prier pour qu'il soit vite remplacé par quelqu'un de plus respectueux du service public et de la vérité. Je suis d'accord avec toi, Pierre. Je suis conscient de la façon différente dans la quelle cette affaire a été suivie au Québec et par ailleurs. Ici, aux Etats-Unis et à Toronto, la folie médiatique était mauvaise. Je n'ai pas l'intention d'excuser Rob Ford avec mon blog, mais plutôt de rappeler beaucoup d'entre nous à respecter sa dignité. Great reflection, Br. Santi. Thanks. Thanks very much for this Santiago. I posted the following elsewhere: Rene Girard, the Stanford U. French sociologist, has a fascinating analysis of the basic human instinct to scapegoat. In brief, and somewhat simplistically, Girard's thesis is that scapegoats are loathed by the majority (for whatever perceived personal or social failures). The mass (or mob) uses these failings to project all of their own violence and self-doubt on the one being scapegoated - however justifiable the charges may be. In modern parlance that would include, for example, the corrupt DUI council member, the pot-smoking teacher, the sexually exploitative journalist, etc. Girard holds this scapegoating to be a universal phenomenon found at the basis of all societies - a consequence of fallen human nature. In its most extreme form it leads to human sacrifice which he chronicles in the historical and mythical record of all known human societies. He ultimately came back to the Catholic Church after recognizing that only the drama of Christ on the Christ can expose this aspect of social sin in such a way as to neutralize its power. Thank you very much for this. I appreciate this sort of analysis because it helps me understand more deeply our tendency to use others as scapegoats, and our behaviour as bullies. "While I felt disgusted with Ford’s behaviour, I ignored my own. I turned into a bully." Wonderful!